I am trying to enable mcrypt.so but there is no entry for that in php.ini. I added one and restart server but i am still taking "Call to undefined function mcrypt_encrypt()" error. Check and make sure that you first have the php_mcrypt.so (not dll) and make sure your pointing PHP in the right extensions folder. If you do not have that file, you will need to compile it. And there is no file called php_mcrypt.so in "PHP5/lib/php/extensions/no-debug-non-zts-20100525". Can i just download php_mcrypt.so from somewhere? I really don't know how can i compile that file. I event don't have any source code of php_mcrypt.so. Can you include this file to the PHP5416.dmg? You will need to download and install Xcode if you wish to compile your own extension. This package comes with the developer tools to develop for the Mac. PHP also comes with a tool called phpize that allows you to compile extensions. For your convenience, I'm going to compile this extension for you but I can't guarantee it will work on your machine. I will post back when it's ready. Here's the compiled mcrypt PHP extension. It is named mcrypt.so and not php_mcrypt.so. Please let me know if it works and I might compile my own pre-configured package for you since the one Aprelium provides is quite old now. Sorry, I tried but no luck. 4) Tried to run mcrypt_encrypt function in my php file. Still getting "Call to undefined function mcrypt_encrypt()" error. Make sure to change extension_dir directive to point to the location of the extension folder. Is it loading the correct php.ini file and are any other extensions loaded? Other extensions (curl, openssl, exif etc.) loaded correctly and php.ini path is ok i guess. Maybe mcrypt.so needs some other files? Probably irrelevant but in the php.ini there are some entries like ;mcrypt.algorithms_dir and ;mcrypt.modes_dir. 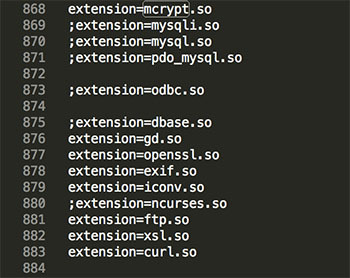 And these are the active extensions in php.ini. Everything looks okay. Did you try restarting Abyss after making the changes to php.ini? I'm going to build a PHP5 package for you and have you try it later. Maybe the extension didn't compile properly. As far as I know, everything looks to be configured properly. I will have this pre-configured package available today or tomorrow. ok, i will wait. thank you. I know I said that I would have it ready for you by today but I ran into some trouble compiling the libraries for jpeg and imap. Hopefully it will be ready by tomorrow. Hang in there. Here's the pre-configured PHP that I promised. It doesn't have all the extensions that Aprelium's pre-configured package has, but it should be enough. The Mcrypt extension is built in and all shared extensions are set to load automatically. Please let me know if this works for you. Thanks. Thank you for that. I downloaded your pre-configured package and put /Applications folder and restarted the server. I tried to run a php file. Unfortunately it takes 45 seconds to load and gives 500 server error. Probably we missed something but i don't know what? Why Aprelium Support is silent about this situtation? Anyway, thanks again for your effort. Contact Aprelium's support and they should be able to help you further. I don't understand why it didn't work on your end. Check the fastcgi.log or cgi.log for more details and you might want to send the log files to Aprelium so that they can get an idea of what maybe going on. We will release very soon a PHP 5.5.11 preconfigured package for Mac OS X. Building PHP for Mac OS X is always very difficult since the libraries bundled with each version of the OS change hence the issues that you may experience when using a binary linked on a version of Mac OS X different than yours: our solution is to build all the dependencies on our own and ship them with the PHP package.